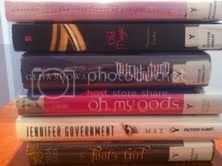 It always seems like no matter how carefully I plan it, my library holds always come in at once. Here's the stack of them, lots of great backlist titles: The Sweetheart of Prosper County, Old Magic, Intertwined, Oh My Gods, Jennifer Government and Fool's Girl. Plus, I got this book for review: The Not Quite Perfect Boyfriend by Lili Wilkinson. I'm really enjoying it... I had just finished reading a few things, and it came at a perfect time. Oh great haul! I really want to start the Intertwined series! Ah, you got so many books I've been meaning to read (and still haven't). Fool's Girl, Oh My Gods, Intertwined, Old Magic...I'm looking forward to your reviews! Awesome pile! I hope you enjoy them all!